Starting with CUCM 8, there is is a feature that allows you to achieve this with only 2 partitions and Calling Search Spaces, plus translations, no matter how many source/destination sets you have. This significantly reduces complexity and the likelihood of error. A configuration example follows. Create 2 partitions, “PLAR Pilot” and “PLAR Patterns.” We will use PLAR Pilot to hold the single empty translation pattern, like in the classic configuration. Now create two calling search spaces, PLAR Device, which contains only the PLAR Pilot partition, and PLAR Patterns, which contains only the PLAR Patterns partition. 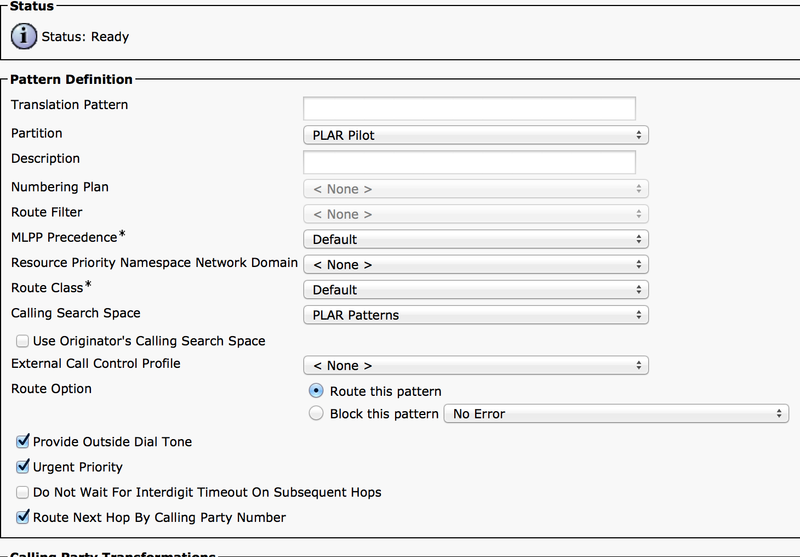 Next create a translation pattern in PLAR Pilot with the pattern empty, the CSS set to PLAR Patterns, and “Route Next Hop By Calling Party” checked. The “Route Next Hop By Calling Party” option looks for a match in the CSS Partitions using the calling number rather than the called number. Next, we determine the calling number, and the number is should call to. In this case, DN 3300 should call 3000 when it is taken off hook. Create a new translation pattern in PLAR Patterns for 3300 to match the calling DN, assign a calling search space that can find 3000. Set the Called Number mask to 3000. Assign the PLAR Device CSS to the phone/line 3000. When 3000 goes off hook, it matches the blank pattern in PLAR Pilot. The call then looks for a match for the calling number 3000 in the PLAR Patterns partition, and matches the 3000 translation pattern. The translation pattern then sets the called number to 3300, and proceeds to ring the phone. This configuration can greatly simplify the configuration of PLAR on a CUCM cluster, requiring only 2 partitions and calling search spaces, and one translation pattern per source/destination and one for the initial match.